Think action cameras and you might automatically think of the footage captured by dare devil parachutists, cool people on skateboards, or that weird yet fascinating TV show in which they put cameras on cats to see what they got up to. Either way, you not might consider your children as action cam users... until now. Having put together a fun and useful photography kit, My Doodles are urging our kids to get active with their Action Camera Bundle. 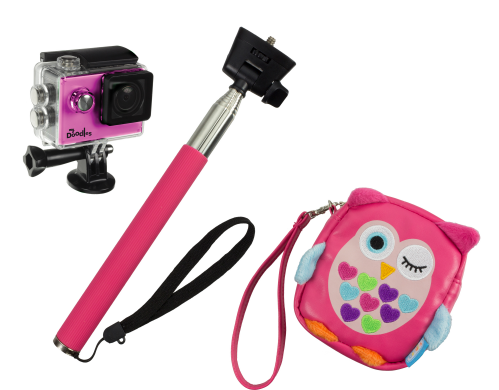 Included in the kit (which comes in either the green alien 'Astro', or 'Olivia' the owl style) is a carry case, a telescopic extension pole, a bundle of mounts and straps, and the camera itself with a water-proof enclosure. We were sent one of the Astro kits, and although we were expecting something a bit cutesy-putesy, it really wasn't. Apart from the colourful carry case which very much looks like the character, there are no other indicators that this kit is designed for kids, which we think is good thing. The camera itself matches the character's colour (in our case, green) but also looks very much like a normal action cam. Once charged up (via the included USB cable) the kids will get 90 minutes of use out of it, while recording in 720p HD. The camera features a rear two inch screen to both line up shots, and also play back the footage captured, and the water-proof enclosure is easy to fit and lock and means the kids can get as wet and messy as they like while filming. There is no Micro SD card included so you'll need to get your own. The extension pole was an interesting inclusion. It isn't a selfie stick per se, as once the camera is screwed into it and extended the whole length of almost a metre, there is no way to control it. Kids could set the timer in photo mode, but the real fun comes from simply using the stick to elevate the camera and get it into some unusual places (or as a horrific weapon, as the three year old we gave it to did). In order to attach the camera to the stick, the kids first have to put on the case to use the screw port. This is good, as the cam itself could easily be damaged if being flung about by kids, and the water-proof case protects against more than just water. Also, the included mounts let kids attach it, with some 3M sticky plates, to a surface such as a skateboard, or indeed strap it to their bike helmet. 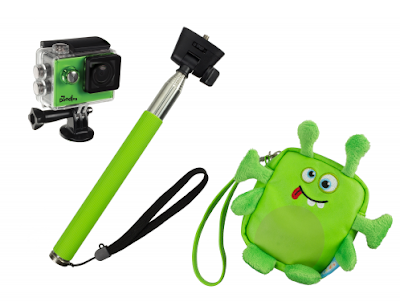 As we said, with the exception of the green alien carry case, this is very much a regular action cam kit. Thanks to a simplified operating system, the camera in the My Doodles Action Camera Bundle is easy for little fingers to operate, while being light enough for little hands to hold up, even when at the end of the extension pole. And let's face it, your kids are going to get up to far more interesting things than you are, so why shouldn't they have their own action camera?